Well now...hello there! How the heck are ya?! Oh me? I'm friggin GREAT!!!! Ahem, have you noticed anything different?? Have you taken a gander around this here little bloggy and seen what we've been up to? Huh? Have you?? :D Crazy right?!!?!? GAAAAAAAAAAW I'M SO EXCITED TO SHOW YOU OUR NEW LOOK! Haha, I'm sure you've already looked it up and down by now. And that's ok. But I needed to make some sort of deal about it! Because I COULDN'T SLEEP LAST NIGHT KNOWING THIS WAS GOING UP TODAY! Ok ok, I'm done. Ahhhhh I'm just in love. Thank you to Miss Melisa over at Pie N' the Sky for her gracious attitude, hard work, and darn crazy good artistic abilities. You, my dear, have made one happy blogger! SooOoOooOooo, can I ask?? What do ya'll think??? Gosh I can't stop looking at everything. We'll be tweaking little teensie things here and there, but for the most part- this is our brand new spankin' 2012 lookie look! You know what I think when I think new blog look? Brussels Sprouts. No, not really. But how the heck do I transition from above to below? Right...I have no clue either. "Brussels sprouts are what actually inspired this new look! "...flat out lie. I have no clue. Truth: I hated brussels sprouts growing up. HATED. H A T E D.
Growing up whenever I saw them on my plate come dinner time, I secretly hated my life. I wished I was someone else, far far away from this time of day. I knew there was no getting around them. My parents had a strict "eat your vegetables before leaving the table" rule...and I hated that rule with a passion that burned a million fires deep within my tiny body. And now here we are! Haha. So as I grew up, my palette changed, my mind changed, and more importantly- how I looked at food, changed. After marriage, I dedicated myself to forever researching the values of foods and how to provide my family with the best dinners (breakfasts and lunches too) I could possibly muster up. More truth: Brussels sprouts are actually incredibly good for you. Much to my dismay...at first. Who would have thought? After much research I couldn't hide from this fact. They're incredibly beneficial to one's body. Contain phytonutrients called glucosinolates- these are thought to fight cancer. Also contain isothiocyanates, which trigger the liver to produce detoxifying enzymes. This of course aids in the elimination of potentially hazardous stuff in our bodies. Can help reduce the risk of premenopausal breast cancer. Contain loads of Vitamin A. Crazy right? Brussels sprouts...who knew?! 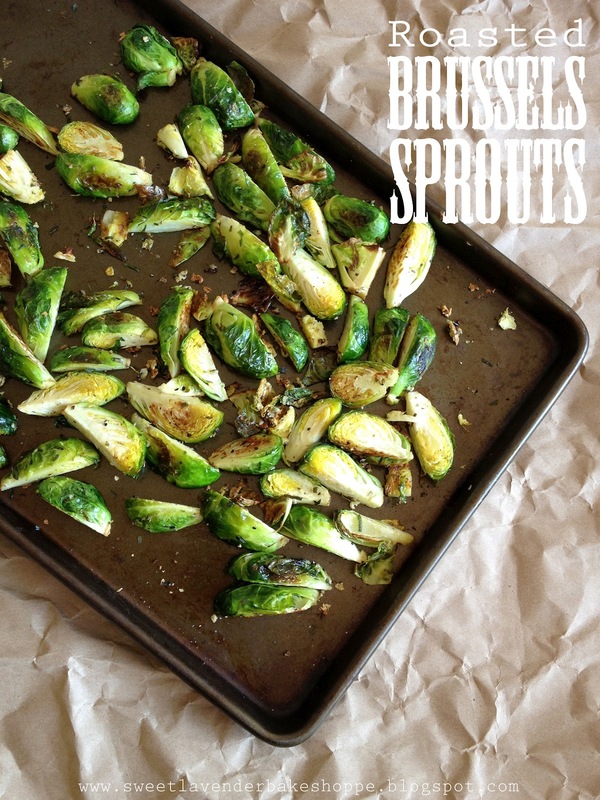 Double Truth: When roasted, brussels sprouts are AMAZINGLY AMAZING. Like, totes. I knew I needed to get over my brussels sprouts fear. Something considered a "Power Food" needs to be included in my recipe repertoire..and stat. I'm a huge fan of roasting vegetables, I pretty much will eat any type of veggie roasted (oh and fruit! !...but that's a different story...). There's something about the caramelization that roasting does that I just fall ga-ga head over heels for. Plus little bits get crispy, while the rest of the veggie is softly cooked- YUM to the O! So I whipped out my best tricks and came up with this recipe. We loved it. We eat it almost weekly. No joke. We just had it last night. Hi, I'm Christina and I'm a brussels-sprouts-a-holic. Truth. 2. Wash and dry your brussels sprouts. Cut up into 1/2s or 1/4s depending on the size. You want them to be as close in size, as possible. 3. In a bowl, toss everything together. Spread in an even layer on an ungreased baking sheet. 4. Bake about 20 minutes, tossing 1/2 way through. You're looking for browned edges and the sprouts to be cooked all the way through. **They go from a light green to the most beautiful emerald green color when roasted. **Can be served room temperature. You just warmed my heart! Thank you so so much. Looooooove the new look! It's so fresh and fun and pretty! And I'm totally inspired to give my blog a make over. This is so funny because the other day I picked up some Brussels Sprouts at Trader Joes. I didn't want to buy them but I also heard how good they were for us. I HATED them growing up, but I was determined to get over it. And you know what, we liked them... a lot!!! Yay!!! Can't wait to see what it looks like! Not that your blog needed it. And hooray for brussels sprouts! The veggie we never knew we liked! Those look super tasty! I'll definitely have to give this recipe a try! And I love your new look! Love Melisa too! She did my blog design as well! Thank you thank you!!!! That means the world to meeeee!!!! I know she did your bloggy ;) That's where I found her! I loved your look so much! Yay for Melisa! Mmmm... looks delicious! Can't wait to try it! Thanks for posting.